As Medicine Girl so eloquently put it, I like the idea of a montly family blog. Apparently I do. But it gives me lots of things to write about when I finally do get around to it. The fourth of July weekend was a really eventful one for us. We started it out early on the 2nd when we went to a Rocky's game courtesy of one of Josh's co-workers. They were great seats, and we even relived the college days a bit in the parking lot before the game. We had our own version of a tailgate party. The game was great, and so were the seats! We don't often get to sit in the club level! The food is a lot better up there, but I only was really interested in the beer. Dr. Cohen, my immunology professor, raved about Dale's Pale Ale, and went so far as to give one of my classmates a can on their birthday during class. So I was intrigued. Turns out they sell it at the game and I picked one up! Josh and I split one and we both liked it. It's really hoppy though, and bitter, so if you like your beer super smooth, it's probably not for you. We did like it enough to buy a case of our own though.. The Rockies ended up winning. And that was great, especially the next day when we got 4 tacos for a dollar! On the actual 4th of July Josh and I started out the day on a loooooooooong bike ride. We took off down the Cherry Creek trail with the intention of getting to the mall and enjoying a drink al fresco before coming home. Well, the trail isn't very well marked and so we ended up pretty much all over the place. All told, I think we went over 20 miles on our mountain bikes. By the time it was done I was pretty tired, but I was glad we took the time to get in such a good work out. Tom had the coolest ice cube tray. It made shot glasses. Nothing tastes better (as far as hard alcohol goes) than a really ice cold shot. If it's not cold, it's just gross. And this little guys did the trick! After a while Josh's brother Joe, his wife Debbie, and his dad Duane left to go to the Rockies game. Tom's is close enough that we could actually see them in their seats! One thing Rocky did have is a friend. Tom has a boxer named Micky, and so we introduced the two. They hit it off pretty well, though I could just see Rocky thinking "I'm too old for this s!$&" while Micky kept pouncing and pouncing on him. Eventually they calmed down enough for us to snap a shot of them together. Later that night we watched the fireworks and headed back to A-town for some rest. We had big plans for the breweries in Fort Collins on Saturday, but ended up at the Southlands Farmers market. That was pretty fun too, and we got some delicious veggies, and honey sticks. That night I got some terrible news. My grandfather passed away on July 5th. Josh and I quickly got some tickets on priceline and managed to get back to Fargo on Monday night. Although the tone of the trip was sad, there were times of fun as well. My parents have a Wii and we spent a whole bunch of time playing with it. The best was when everyone was boxing! Josh pretty much beat everyone. Over and over. Probalby more fun for him than us, but it was a good time. Well, I think this has been a long enough post for now, but I will definitely post this weekend when we get our new puppy! That's right, Rocky's going to be a big brother! After seeing Tom's and Dara and Tim's boxers, we decided that's the next breed for us. So we found Tom's breeder and Mugsy will be coming to our place tomorrow night! I'm sure there will be many more pictures to add after he's here! Well after being gently reminded last weekend by Sonny and Becky that we've not blogged for over a month, I figured we better get on it. It's been a pretty busy month, but a good one. I'm done with my first year of med school! Dah du da dah!!!!! Josh and his sister Jordan and I went out to a brew pub then met a bunch of my classmates at Washington Park for some festivities. It was a really great time, but I was brutally reminded that I really don't drink very much anymore. 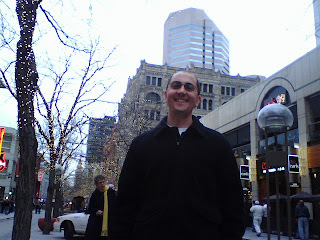 The next day was seriously rough and Josh made a lot of fun of me for being so hung over after drinking about 4 beers. The next afternoon, after I nursed myself back to health, my mom and sister come into town! We had a really good time. We spent two days in Greeley at my godparents place, then came back to our house. It was the first time my mom had seen our new place since we moved in, and I think she liked it. Josh was in the middle of painting at the time, but the paint has really made this place our own. He's almost done with the whole first level. It looks nice and homey now, and we really love it. 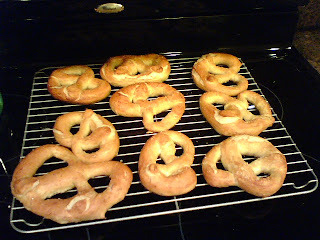 That's right, fresh soft pretzels: from scratch. I am fabulous. This past week I've been taking Rocky with me every time I run. This has its ups and downs. Rocky is really hairy so he gets hot much faster than I do. This makes him an awefully slow running companion, not to mention he gets distracted by all things shiny and moving. Having him with me does get me out of the house though. There's nothing more heartbreaking than his face when he realizes he's not coming with, or that we're not going running after all. So, rather than face those sad eyes, I get out the shoes and the leash and away we go. Rocky has also been campaigning like a politician on our runs. There's a long uphill stretch where we run along which Rocky finds any excuse he can to pull us over to the side for a rest. Usually these are potty breaks for him, but this past week there were loads of people on the trail. So Rocky has been shaking hands and kissing babies. We ran past a grandmother pushing a stroller who asked if Rocky was friendly to children. I said he was and she waved us over. Rocky immediately pokes his nose in and licks the little guy's face. The kid giggled so all was well, and Rocky the politician just ate up all the attention he could get. Keep a look out, he'll be on a campaign, or at least a running, trail near your sometime in the near future. Yesterday we went to see the new Indiana Jones movie. It was a little odd at parts, very different from the others, but good nonetheless. I think we both had a great time with it. After that we went to use the rewards coupons we had received through our World Market account. 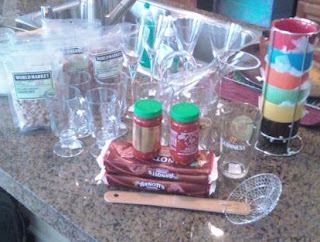 They informed us we couldn't use them all on one large item (we were thinking about buying some art for the newly painted walls) so we ended up with all this sweet loot for a grand total (out of pocket) of 10$! It's going to make for a fun father's day brunch tomorrow! I'm excited to use our tower o'coffee cups! Josh has found a new favorite television show. It's called Ultimate Banzuke and it's a Japanese game show on G4 network. You should definitely check it out if you can. They have people going through obstacle courses while walking on their hands and on stilts. It looks incredibly hard. We both end up cheering and jeering as we watch. Well, that's probably long enough for now. The good news is we've come into a real camera, so we should be able to document all our fun stuff we do this summer, and I swear I'll be better about posting to this blog (like you haven't heard that before). Gotta love 'em. And this one in particular. Josh made us another great breakfast and now we're both sitting on the couch drinking our coffee. Josh is busy reading Small Favor by Jim Butcher. We both absolutely love the Dresden Files, and this is the newest one in the series. I won't read it until my next exam is over in two weeks, but watching how much Josh loves it is making me very excited to read it. Last night we went to the symphony in Denver with Josh's fam. It was a really great show! And before we went we stopped at Bonnie Brae's pizza near DU. They have awesome pizza and cheap beer, couldn't ask for more! And, of course, the best news ever..... The Avs are moving on in the playoffs!!! Woohoo! That news might only be second to the fact that Denver is, in fact, the Napa of beers. I think we always knew it, but it makes me want to keep my fridge stocked with all the area's offerings. I am also thinking we need to start planning a beer tour of the front range. Anyone who's interested, get in touch! And check out this article to read about Colorado's awesome beer country! Well, we're sitting here tonight drinking some Fat Tire and watching game 5 of the Stanley Cup playoffs: Avs vs Wild. We can't help but cheer a little extra harder due to the competitive nature of the match! After all, my fam back in ND is seriously cheering for the Wild. Booooo.... Not cool to cheer for an injury Wild fans.....not cool. On Tuesday night we got to go see the Avs in person and it was a great game. Super physical, but really fun. It didn't hurt that they won 5-1. 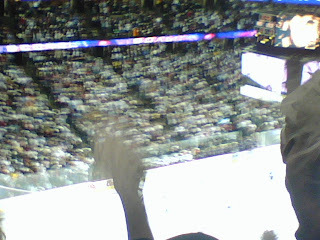 Here's a pic I took of the place freaking out after the first goal! Let's just hope they can keep up the momentum tonight! Last weekend we also went bowling with our friends Wes and Cristin and it was a lot of fun. We went to this crazy bowling in Golden where you can win money if a colored pin shows up at the right pin position. We didn't win anything (except Cristin won a dollar!) but it was a good time. Josh has been taking Rocky for lots of running and swimming and otherwise getting disgustingly muddy at Cherry Creek state park. Last week we even had our first 80 degree day! So, since spring has truly started here, the park has been incredibly busy. It drives Josh nuts to be so sandwiched in an outdoor space like that, and it only gets worse when you're trying to run with Butthead. Rocky not only runs like Danny Devito as the Penguin, but he's distracted by all things shiny and moving. Lisa doesn't know how he does it, she gave up trying to run with Rocky over a year ago when Rocky (to be completely uncouth) crapped himself before she had to be to CSU to teach, so she had to give him a shower in the back yard with the hose. Gross. 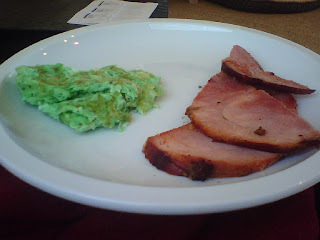 Green eggs and ham! It's like what every kid grows up and hopes to really have for breakfast one day. Awesome. Well, that's about it for us. A whole month wrapped up in a 15 minute post. Wow. We are boring. Hope to hear from ya all soon! Overall it was a great "vacation" and we really had a great time. We also got a new JUICER!!! Josh has been busy juicing the entire produce section of the grocery store and Lisa has been busy learning how to make really pretty omelets. 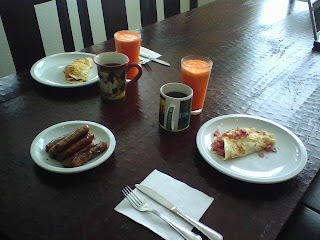 We were so proud of the breakfast we made a few weekends ago we took a picture. The other day Josh also juiced 18 (!) oranges with some strawberries, it was pretty awesome. No lurking. We started this blog to keep in touch, so if you stop by to read, please let us know. We love comments! Keep laughing. We're never trying to offend. Let us know if you have a blog. Lisa's always looking for things to do in, er, between class. So, in the past week, Josh has decided that we've gotten old. Not to be considered alarmist, he came of with some reasons for this realization. He was driving home from work the other day when he started listening to the Fox on the radio. In the course of our lifetime, the Fox has added another decade to their "classic rock" genre. They were playing songs from the 90s. Unbelievable. Our youth is now "classic." Rough. The past couple of weeks we've been hosting medial school interviewees the night before their interviews. Lisa's a sucker, so she offers to pick them up at the airport. 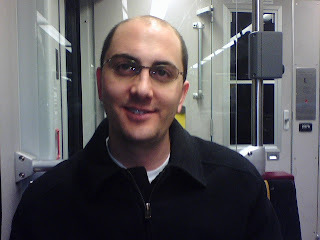 This week, our lovely interviewer actually scheduled his flight for 10:30pm! Of course he was delayed, so he and Lisa didn't get back to the house until after 12. Lisa brought Rocky along in case he was a psychopath. You might be telling yourself, yeah, he came in late, but sometimes when you get those cheap flights you don't get to choose. He did. Why, you ask,did he choose to come in so late? He had an afternoon class. In english. Oy. Well, we're hoping to get to this blog thing more frequently than biweekly. And we're hoping to hear from you all soon. Hope all is well. If you're already here, you probably know us. We're a couple of nerds who are jumping on this blog thing pretty late, but here we are nonetheless. Despite our nerdiness we try not to be too flaky, but we don't always keep in touch with the world at large as well as we'd like. 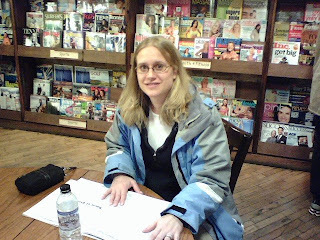 Hopefully this blog can help us stay in touch with all of you who we miss, and those of you we do see, but who just like to spy on your family and friends...you know who you are. Josh: engineer in Colorado. Enjoys long walks on the beach and romantic hot wing dinners...romantic because he lights a candle of course. Lisa: med student in Colorado. Riding the gravy train for now so Josh can ride it later. 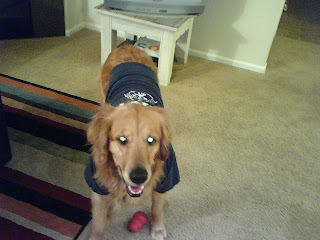 Enjoys nerding out loud and making the dog wear her college t-shirts. Butthead: aka Rocky. Enjoys wearing college t-shirts. Josh disagrees, but Rocky doesn't. Reminds Lisa of a baby without a diaper, minus the crying. Josh says although we've only been married a year and a half it feels like fifty....should be an interesting blog experience..